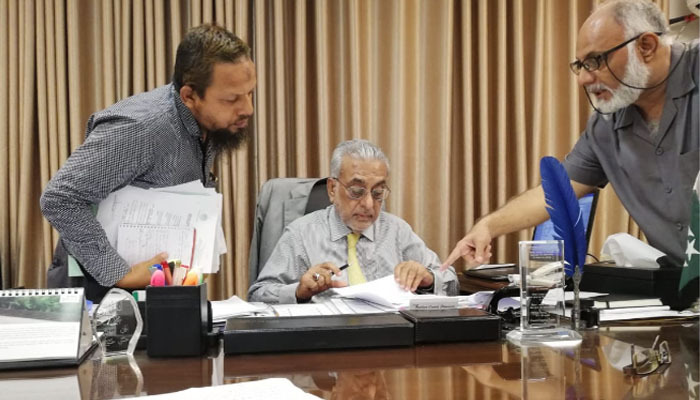 KARACHI: Caretaker Information Minister, Jameel Yousuf, has stepped up his efforts to get back his department’s vehicles being used by the former minister and other persons beyond their official entitlement. According to the list prepared by Director Administration Sindh Information Department Moiz Pirzada, 12 vehicles of his department are still in the custody of ex-minister and other former officials of the ministry. Two luxury vehicles, GS 9116 and GS 7634, which were allotted to the former minister Sharjeel Inam Memon during his tenure, are still in use of his family, while former advisor Sharmeela Farooqi has not returned the department’s vehicle, No-7226, which is still in her custody. Two other luxury vehicles, GS 9967 and GS 305, of the Sindh government are in the custody of another ex-minister and ex-advisor. Vehicle No. GSA 518 is in custody of former director information, presently in jail custody facing corruption charges alongwith Sharjeel Memon. Vehicle No. GSB 074 is in the custody of Muzzafar Sangi, the private secretary of ex Information secretary. Former DG Information, Syed Safdar Shah is still using Vehicle No. G7635. Vehicle No. GS 7625 is in illegal custody of Deputy Director Admin Department, Imtiaz Joyo. Vehicle No. GS 5475 was in custody of the then director information Sami Siddiqi and which is now allegedly reported to by stolen. Talking to The News, Jameel yousuf confirmed the news and said that efforts are going on to retrieve the said vehicle and till Tuesday evening three vehicle has been returned. It is to mention here that the Supreme Court, last week, also suspended operation of the provincial government’s notification allowing renting out the government-owned luxury vehicles to former ministers and officers from whom they were withdrawn on an SC order. Chief Justice Saqib Nisar-led three-judge bench passed this order while hearing a matter pertaining to the use of luxury official vehicles by the former ministers and officers beyond their entitlement, at the SC’s Karachi Registry.